Not clear where the "end of 2015" part comes from. For card holder present transactions, there is an October 2015 date for liability shift for merchants w/o EMV, excluding gas stations, which is in October 2017. It does not guarantee a shift to EMV, but it provides possible financial disincentives to not do it. And I don't think EMV is a guarantee that there won't be breaches in the future, esp. if the attackers are able to get code inside the POS itself. EMV should reduce card cloning, but it won't help in other areas such as card holder not present transactions (online purchases). Even if the POS unit was hacked, won't the One Time Pad nature of EMV prevent merely replicating the same sequence? Google "EMV preplay Attack"; also "EMV Relay attack" for a different angle. Since these are out in the wild, one can hope EMV is already trying to plug holes, however small they might be. I don't really know. My SF Fire CU Visa is not a Sig, and has 0% FTF. They're very generous though, so they're probably eating the fee. But UNFCU is 4x bigger than SF Fire CU, so... I don't get it. 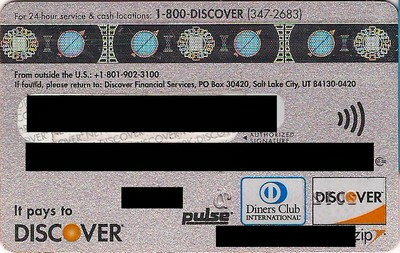 The UNFCU debit card seems to only charge 0.8% for ATM withdrawals outside the US, and they say that's just the MasterCard fee for doing it. Either way, I'll send in the application tomorrow. Love me some CUs. The debit card charges 0.8% for foreign transactions in US Dollars. If the foreign transaction is in foreign currency, the fee is 1.0%. Two more stores to add to the list in Los Angeles (South Bay). They take EMV right now both C&S and C&P. A lot of other small shops in the South Bay have them but aren't active yet. I talked to one of those shop owners who said that their acquirer made them purchase an EMV terminal but said they wouldn't activate the chip reader until sometime this year. I have no problem with DCC. The DCC scam is similar to the high APR scam. It enables the banks to make more money off the suckers, which improves the rewards programs for us. I don't mind them charging high APR to those who don't pay their bills on time. There's a difference between you making the mistake and paying big to help us, and a suckers scam, which is what DCC is. Not clear where the "end of 2015" part comes from. And I don't think EMV is a guarantee that there won't be breaches in the future, esp. if the attackers are able to get code inside the POS itself. Also not clear why they say it would be a huge undertaking, as I'd venture a guess that most manned POS devices are already EMV-capable. Welcome to FT and thanks for the update! You say they take both - do they force PIN ever, or simply allow whichever the default of the card is? But who's getting the cut with DCC? I thought it was the merchant and POS terminal bank, not the card's issuing bank. Apparently, the merchant sets the DCC fee, but the banks involved have a stake in the exchange rate used for any transaction too. For some interesting background, google "dcc fee" and check out (1) the wikipedia article that pops up showing a sample transaction with and without DCC applied, and (2) a Chris Elliott article from the Washington Post of May 20, 2013 (be sure to see the reader comments that follow the article). There's a lot to be said for the strategy of hitting the ATMs for local currency and doing as many transactions in cash as possible, using credit cards only for the big stuff (hotel, car, air) and watching every credit transaction very carefully. Disagree. There's nothing to be said for using anything other than credit cards, no foreign transaction fee credit cards if out of the country of residence, for any purchase large or small. I couldn't begin to have to worry about running out of local currency and sorting through coins and paper currency whether at home at the grocery or while on holiday. I arrive in London, and if necessary make a £10 withdrawal and more often than not, return home with the £10 still in my wallet. The last time I paid cash for anything is let's see some time last April. 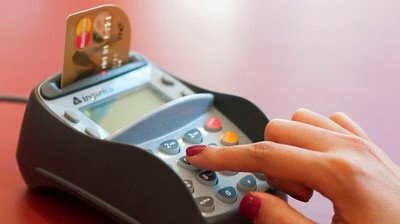 I will not allow a possible confrontation prevent me from using my credit cards. One time I went into a subway shop in London, ordered a sandwich and at the cashier with all the credit card decals showing offered my credit card and was told sorry £5 minimum. While that is their perogative, I should not be embared as they had no sign indicating such. I was told everybody knows you need a minimum of £5 for credit card transactions in this country. I walked out, leaving them with the sandwich. I will not be intimidated nor should anybody. We've discussed what to do if a merchant refuses to void a dcc transaction. Never offer to pay cash. That just plays into what they're doing. Simply circle the amount in local currency on the slip, cross out the statement write in bold letters local currency not offered and sign. And then dispute the charge It's come to that three times in the last whatever number of years this cancer has been around. Twice the charge was charged back to the scammer; the third time my bank simply refunded the difference as I explained above. I will not allow myself to be scammed or forced to pay cash for anything unless absolutely necessary. I've read the Wikipedia article before. From Chris Elliott's article here, this quote is amusing, "Visa requires retailers to disclose currency conversion rates plus any associated fees and ensure that cardholders are offered a choice to accept the DCC services." Yeah, right... It's just like CapitalOne's line for their non-EMV cards where, "Any merchant must accept all cards at the point of sale." With both DCC and EMV, the best we can do is complain, complain, and complain. I agree with your method of using cash for small transactions overseas and saving card use for larger purchases while watching carefully to make sure you don't get hit with DCC. I don't know if you were referring to this article where some comments are saying it's not a scam. I certainly think DCC is a scam, and merchants are sneaky, deceptive, and offer false reasons for saying it must be done that way. 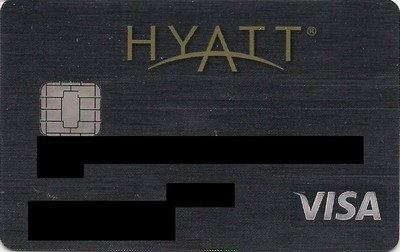 I need to make a point of reading the fine print before they swipe my card at a hotel overseas. With an in-person transaction it's somewhat easier because you can see the amount being charged written on thermal paper. Chip-and-PIN is the best defense against this scam because presumably you'd have to be able to see the amount being charged before entering your PIN. No complaints here, but I also want to limit the number of potential disputes I have. I have walked out on merchants who have imposed some arbitrary surcharge or minimum purchase amount before, and they almost always change their tune when you do so. People don't want to be confrontational, so they usually buy an additional item or pay in cash. I also refuse to allow them to scam me, but I take into account the risk/hassle factor of the transaction. For very small purchases, I am likely to use cash from the get go just to avoid a hassle. I talked to one of those shop owners who said that their acquirer made them purchase an EMV terminal but said they wouldn't activate the chip reader until sometime this year. 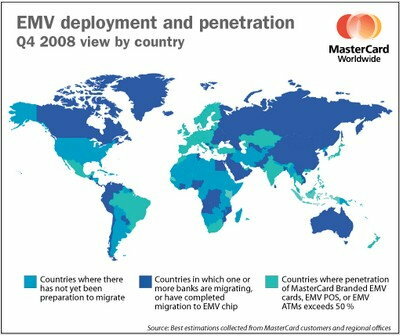 This might explain a bit of the delay in enabling EMV processing. The POS hardware installers often charge for every feature they enable on the terminal. I'm guessing a lot of merchants don't want to pay for a feature they won't use often. At least I know that's why a lot of NFC terminals aren't enabled around here. My local Trader Joe's in St. Louis has EMV capable Ingencio terminals, but there is a plastic cover preventing insertion. Cool, thanks for sharing! These places are right around my neighborhood; I'll go try them out today then! If they do work, they'll actually be my first EMV purchase in the US. I'll go and test them out today, probably use AndrewsFCU and Chase Hyatt to see which way it goes through as. Thanks for the welcome! All my cards are C&S (Amex and Citi), but I have tested all of them at both locations and they all work as intended. The liquor store I just swiped my card one day (it had a wire attached mini pin pad with a swipe reader and a chip reader) and it said "insert card" to my surprise. The owner of the shop behind the counter offered to help but I told him "no I can do it". So I inserted it and left it in there until I signed the receipt the guy had handed me. After that the mini pin pad started beeping and displayed "remove card". The Artesia Produce Market was nowhere near as smooth and should stand as a lesson of why it is important to train your shop staff. The people here had no idea what to do with my card. They kept on trying to swipe it. They didn't have the mini pin pad in front of the customer so that I could help them. In the end they manually entered my card number and they did this every time I shopped there for nearly over a month. Then I went in one day and they had figured it out. I handed my card to them and they inserted it into the mini pin pads card reader and the transaction went through as a chip and signature transaction. I suspect that the problems at this store were two fold. The first being that they had no training with chip cards on their new EMV terminal and the second being that the one cashier who is their most of the time speaks almost no English. 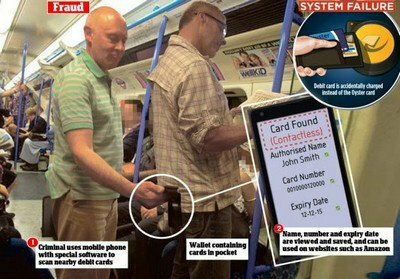 He probably couldn't understand what the terminal meant when it told him to "insert card". Anyway, all their staff is now trained to use chip cards properly. I just hope that the rollout of EMV terminals in the US this year isn't plagued with these sorts of undertraining problems. I figured you were from the South Bay too when I saw your post about the Torrance Walmart (which I had tried too). I think your AndrewsFCU card will go through as a C&S transaction since it's listed as priority 1 and these are obviously online terminals. The shop owner that I spoke to said that he wanted to enable the chip reader, but the acquirer couldn't do it and wouldn't do it until later this year. I think the reason why we see so many disabled chip readers on terminals is because a) the acquirer doesn't support EMV yet or b) it's a big box retailer like Target or 7-11 who's own backend must be updated to support EMV. Keep in mind that a big box retailer's card processing backend is much more complicated. 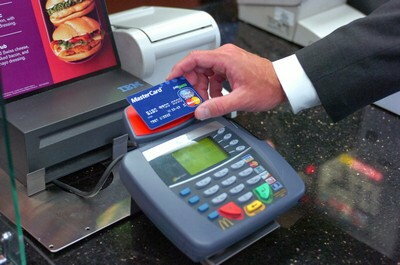 The card processing systems are linked to a bunch of other systems that the store uses. This could require a lot of changes to their systems. 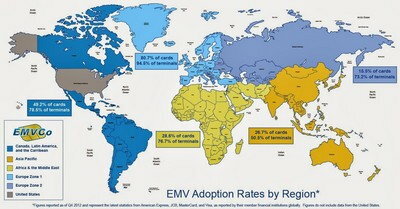 Weren't acquirers required to support EMV by April 1, 2013? Of course I wouldn't be surprised if they just ignored the deadline.